Love Coffee? Like Pizza? Do you fancy quotes such as "A Yawn is Just a Silent Scream for Coffee" in poster sizes? If so you’ll absolutely love our current Deal of the Week. While the deal comes packed with great content, that’s not all there is to it. It also sports an unbelievably low price. Instead of a regular 750 dollars you will pay the amount of nine dollars. You read that right. Nine dollars. Whether you need some motivational posters for your office or you’re looking for some fun vector illustrations to use in your latest project, this Mighty Deal’s got your name on it. You’ll get 150 high-quality vintage vector illustrations from Vintage Vectors Studio and Lorand Okos, that covers a wide gamut of topics from coffee to pizza to motivational posters. Customize them any way you’d like with the original .EPS files, and JPG preview files. 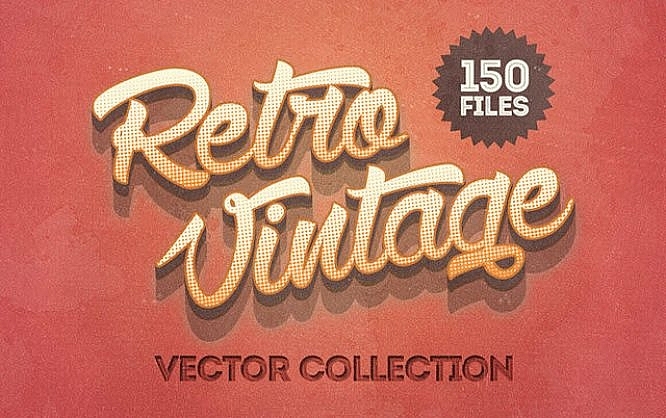 Beef up your designer toolbox with this gorgeous collection of 150 vintage vector illustrations! Use these vectors as fabulous motivational posters, design add-ons or fun signs covering everything from pizza to coffee. Step back in time with a high-quality retro feel exhibited on each of these signs. Easily change up the text, colors and details by customizing any of these illustrations with the included .EPS vector format. Scale these files up or down in size as much as you’d like without fear of losing a single ounce of detail. Normally, this professional collection of vintage vector illustrations sells for $750, but for a limited time only, you can get all 150 vectors for only $9! That’s a saving of 99% off the regular price! In a hurry now? Get going! Click here and we’ll transfer you to Mighty Deals, where you will want to press the prominent button calling for you to "BUY NOW". This article is sponsored by Mighty Deals and as such an advertisement. Noupe does not participate from sales on an affiliate basis, however. Our new ads format “Deal of the Week” is run once a week at max. So if you want to book a deal for your product, get in touch with the friendly staff over at Commindo Media.